Barbara Lea Taylor is a legend in New Zealand garden writing. She gives so much life and personality to the roses she writes about in her books that you want to meet them. This is one of two great little rose books that this author has written specifically for growing roses in New Zealand gardens. She is an author I can believe in, who writes with gardening passion. Old-Fashioned Roses is "dedicated to my gentle feline friend Dimity, a good companion for eighteen years", which in itself is all the reason you'd need for reading and enjoying this book. Old-fashioned roses need to be understood - particularly the once flowering varieties. And we have become very rose greedy, with so many continuously blooming types given emphasis. This book restores the balance and talks a lot of sense. The reader is not assumed to be either an garden idiot or a specialist collector. 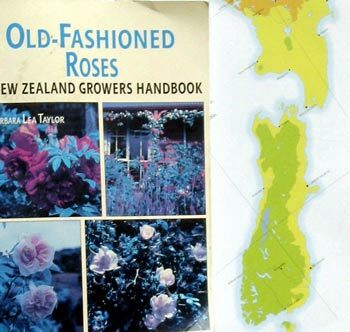 Barbara Lea Taylor has also written a similar book which details how David Austin's English roses behave in New Zealand's conditions. Unfortunately I've mislaid this book - this might explain why I keep planting these roses in spectacularly silly spaces.